Honey Remedies For Everyday Problems! Honey remedies have been shown to improve many health concerns. Learn how to use honey to improve your health. In some instances it can actually cure many diseases. Is honey healthy? You bet it is. Scientists accept it as a very effective medicine. 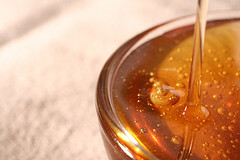 One reason for the honey health connection is due to its antibacterial properties. It is good for the skin when used externally as well as supporting overall health when eaten. Honey remedies are safe for almost everyone to use (See note at bottom of page). Today's science says that even though honey is sweet, if taken in the right dosage as a medicine, it does not even harm diabetic patients. ANEMIA: Enriches the blood. The darker the honey the better. Take 1 ripe banana with 1 tablespoon of honey, 1-2 times a day. CONJUNCTIVITIS: Dissolve honey in equal amount of warm water. When cooled, apply as lotion or eye bath. COUGHING: An excellent alternative to cough syrup especially in children over the age of one. See this research article from Penn State College of Medicine. CUTS and BRUISES: Apply a honey compress to soothe, encourage healing, and prevent infection. DIGESTION PROBLEMS: Mix equal amounts of honey with cider vinegar and dilute with water. FATIGUE and EXHAUSTION: Eradicates tiredness and fatigue almost instantly because it is easily absorbed in the blood. Dissolve 1 teaspoon of it in warm water. HEADACHES and MIGRAINES: Take 2 teaspoons at meals to prevent headache. For migraines, take 1 tablespoon dissolved in a half glass of warm water. Repeat in 20 minutes if migraine persists. HEART DISEASES: Can fight against cholesterol. Pure honey taken with foods daily instead of sugar helps lower cholesterol. HIGH BLOOD PRESSURE: Mix 1 teaspoon of honey, 1 teaspoon of ginger juice and 1 teaspoon of cumin powder and take 2 times a day. 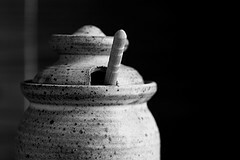 INSOMNIA; Take 1 teaspoon of honey mixed in lukewarm water or milk and drink before going to bed. MOUTH SORES: Put a dab on sore places in mouth. SKIN: rub into skin as a revitalizing mask. It is a good moisturizer. It also helps in reducing skin problems like pimples. SORE THROAT: Let 1 teaspoon of honey melt in the back of the mouth and trickle down the throat or gargle with honey water. TEETH: Helps to maintain and protect teeth. UPSET STOMACH: Take 1 teaspoon of honey, juice of a ½ lemon with a hot glass of water first thing in the morning. Unpasteurized honey should not be eaten by pregnant women and because honey contains a certain bacterium that might be harmful in infants; it should never be fed to children younger than one year old. Otherwise it could lead to food poisoning. Also to enjoy honey benefits, you should use a cold-pressed variety because...just like many products that are heated for preservation and faster pouring; the healing elements of honey are destroyed during the process. Next time you hear someone ask "is honey healthy?" let them know of it amazing healing properties. You will giving them a new tool for keeping their body healthy. Honey remedies are surprisingly effective. Keep some on hand for the next time you have some of these health problems arise in your family.